Too close to call in Australia election? Sydney, Australia (CNN) -- Like a pair of exhausted boxers entering the twelfth round, clinging onto one another as they drunkenly trade jabs, the two contenders to be Australia's next prime minister have both been swinging, hoping for bruising blows, but neither has emerged as a clear winner yet. In the final hours before voting began Saturday, Labor Party incumbent Prime Minister Julia Gillard and opposition challenger Tony Abbott embarked on a marathon final push, darting from marginal seat to heavily orchestrated press event. The Australian public has been subjected to a barrage of largely negative television commercials by either side, which zeroed-in on perceived failures of each leader. Now though, those ads have stopped, giving a welcome pause for voters to reflect on who they want to lead their country. Gillard's ouster of former premier Kevin Rudd in June, described by some as a "palace coup," ­has featured heavily in the ads. But so too has Abbott's perceived lack of fluency on economic matters and his description of global warming as "absolute crap." He has nevertheless vowed to match Labor's proposed cut of five percent in Australia's carbon emissions, among the highest per capita in the world. Video: Who will be the next Australian leader? Abbott has the dubious honor of being called the "mad monk," a reference to his training as a Catholic priest. He's the plain-speaking leader of the center-right coalition, a fitness fanatic, who has made a virtue of his athletic prowess, promising not to sleep for the last 36 hours of the campaign, saying he will work "every minute, of every hour, of every moment." He told a bus load of media the public expected a candidate for prime minister to be "bloody keen" ­and, apparently taking a leaf out of UK Prime Minister David Cameron's play-book, he's going for an all-nighter, just allowing himself a cat-nap between energy drinks. Abbott has put the economy and immigration at the center of his campaign, fighting hard against Labor's proposed Minerals Resource Rent Tax, a so-called "super tax" on mining profits that contributed to the downfall of Kevin Rudd. Gillard watered down the proposal hoping to head off some of the anger from the powerful mining lobby, which saw the 40 percent levy as a retroactive tax grab. But Abbott is promising to scrap it altogether. He's also taking a hard-line on immigration, vowing to turn around vessels carrying immigrants, and setting up an immigration processing center on the pacific nation of Nauru, which is not a signatory to the United Nations Convention Relating to the Status of Refugees. Perhaps one reason the election has been so dominated by immigration is Rudd's plan for a "big Australia" which would have seen the population of 22 million rise to 35 million by 2050, a figure some here feel would put an untenable strain on infrastructure and housing. Gillard though is also in the fight of her life, admitting the race is "tough and tight," describing it as a "cliff-hanger." She's kicked the issue of introducing an Emission Trading System (ETS) to reduce greenhouse emissions into the long-grass, saying a citizen's assembly will debate the evidence first. It was Rudd's failure to push through the ETS that partly lead to a catastrophic collapse in his support, with many feeling he'd broken a promise he made to voters who'd swept him to victory in December 2007. But on the issue of extending high speed internet broadband throughout the country, another hot-button issue here, Gillard has seized the nettle vowing to continue with an ambitious A$43 billion program (US$38 billion) which will deliver lightning fast 100 megabits-per-second to 93 percent of the population. Abbott's A$6 billion scheme (US$5.3 billion) would only deliver 12 megabits-per- second, but he has constantly emphasized the need to cut costs and return the country to surplus. Both candidates are trying to convince a skeptical public that they can get the country back in the black within three years. Australia's economy has been relatively healthy, with the country avoiding the painful recession from which so many other developed countries have been fighting to free themselves. There has also been a war of words about the "costings document" of the Liberal Opposition, which was not submitted to Treasury officials to scrutinize, instead they handed it to a private accountancy firm with links to the Liberal Party. Both candidates share a number of curious biographical details. 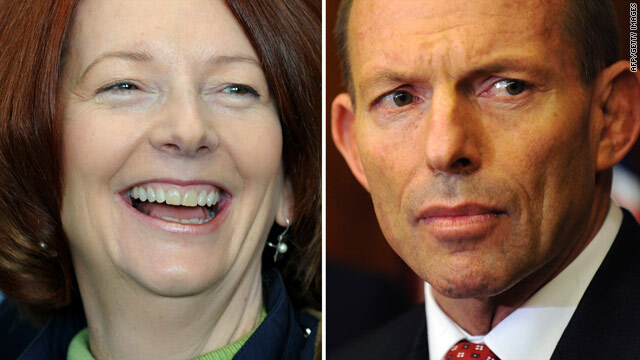 Both were born outside of Australia; Gillard in Wales, Abbott in London, England. Both defeated their former boss to seize control of their party. Now both are neck and neck in the polls, hitting marginal seats in the last 24 hours before voting begins.